Belle Up, a popular maternity and women's boutique in Beverly, will add a Hyde Park location on April 3. Jamenda McCoy of Beverly believes the two South Side neighborhoods have much in common. HYDE PARK — Belle Up is expecting. The popular maternity and women's clothing store in Beverly is adding a second location at 1504 E. 53rd St. in Hyde Park. "I never met a challenge I didn't like," said Jamenda McCoy, who founded the store in Mount Greenwood in 2009. McCoy, a Beverly resident, opened the store to sell high-end maternity clothes for working moms and others. She added non-maternity clothes in summer 2013 and moved the shop to the small yet busy shopping district near the 103rd Street Metra station on Dec. 4. "Once we added the women's stuff, I knew we were moving toward that" second location, McCoy said. 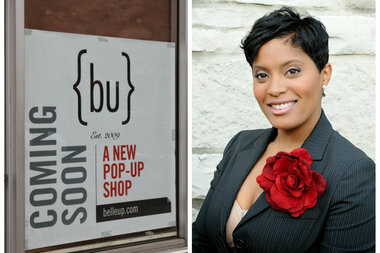 Belle Up's latest storefront is part of a partnership with the University of Chicago. The Hyde Park institution has been working to reinvigorate the 53rd Street commercial corridor by offering retailers a chance to try out their concepts with a series of pop-up stores. "I think that the Hyde Park neighborhood and the Beverly area have a lot of similarities," McCoy said. "I don't want to be a place that sells mass-manufactured stuff that makes you look like the next person," McCoy said. Her store that's evenly divided between maternity clothes and women's wear will have until October to decide whether or not Hyde Park is a good fit. "I see it working," McCoy said.